In October and November 2012 Andy conducted a field research for a Finnish NGO Finnwatch for its report concidering the responsibility of Finnish private label food brands. Andy and Finnwatch investigated two tuna companies called Thai Union Manufacturing and Unicord and a fruit processing company Natural Fruit. Interviewing the employees (which of whom most were migrant workers from neighbouring countries) Andy found serious labour rights violations such as use of forced and child labour, unlawfully low wages, excessive overtime, abuse by managers and unsafe working conditions. 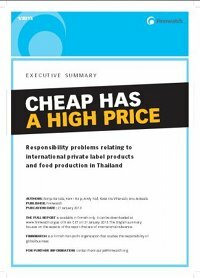 A 14-page excecutive summary of the “Cheap has a high price” report in English can be found here. The full report is only available in Finnish. Click here to find the Finnwatch news and some further links on the subject.